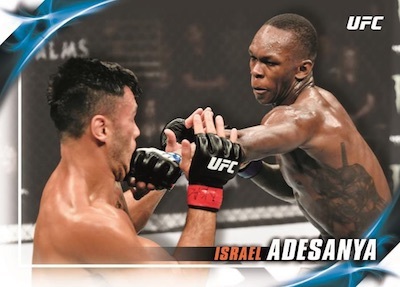 A constant in the MMA card scene, 2019 Topps UFC Knockout utilizes a combination of the basic KO styles alongside a look at other Topps brands. Keeping the same Hobby-only format of 2018, every pack has one autograph and one relic. Boxes bring that hit total to four each for autographs and relics. All hits are numbered to 200 copies or less. 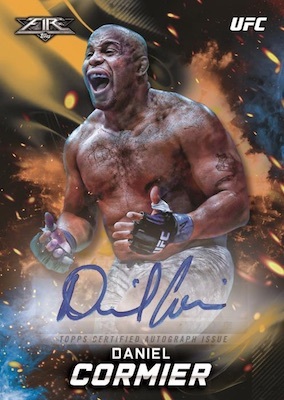 The 2019 Topps UFC Knockout checklist highlights 100 fighters from the past, present and future. Base parallels include Green (#/175), Blue (#/88), Purple (#/25), Red (#/8) and Gold (1/1). 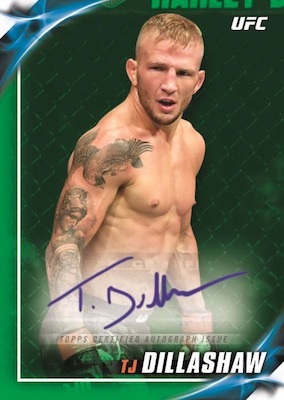 New for 2019, the UFC Fire insert offers top MMA stars in the familiar Tyson Beck style. As usual, the main signature set is Knockout Autographs (#/200 or less). These cards have Blue (#/50), Purple (#/25), Red (#/8) and Gold (1/1) parallels. 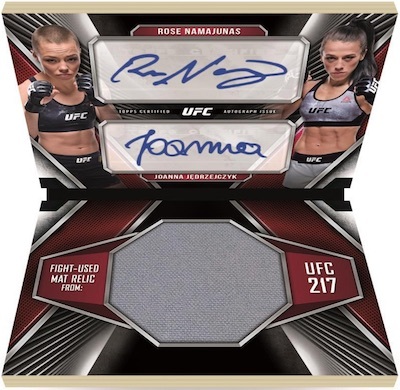 There is also a smoldering flame burning among the 2019 Topps UFC Knockout hits via UFC Fire Autographs. Each card is limited to 200 or less, adding Purple (#/25), Red (#/8) and Gold (1/1) parallels. Putting the nickname with the signature, A.K.A. Ink uses blue ink for the base version that is numbered to 25 or less. Chase options include Bronze Ink (#/10) and Gold Ink (1/1) parallels. 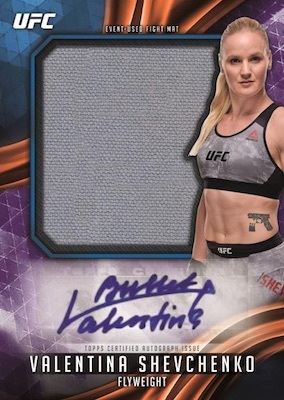 Combining with the autographs to fall one per pack, the auto relics in 2019 Topps UFC Knockout feature memorabilia swatches worn by the fighters or fight-used mats. The Knockout Autograph Relics set comes in at 200 copies or less, plus the Blue (#/35), Purple (#/25), Red (#/8) and Gold (1/1) parallels. Autograph Jumbo Fight Mat Relic cards are a new addition to the product for up to 20 names. These have Purple (#/25), Red (#/8) and Gold (1/1) parallels. 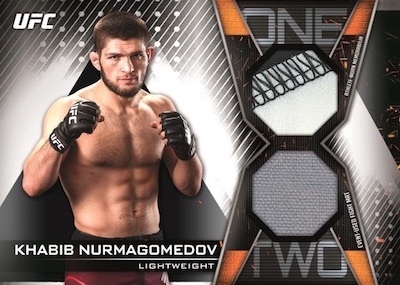 Another guaranteed pack hit, the memorabilia selection includes Knockout Relics, Jumbo Fight Mat Relics and One-Two Combination Relics. All three sets are numbered to 200 or less with Blue (#/50), Purple (#/25), Red (#/8) and Gold (1/1) parallels.